2009 by ybonesy. All rights reserved. Whatever the case may be, this particular Rio Grande cottonwood produces a heck of lot of cotton. The tree is female. You can tell by the seeds she produces in early spring, which by late spring dry and split open, revealing tufts of cotton. Breezes pick up the cotton, carrying it for miles. Yesterday, almost eight weeks after this tree starting shedding cotton everywhere, I drove slowly on my way from work on the look-out for other cottonwoods that still had giant blobs of cotton yet to shed. I didn’t find a one. Within about a mile from home, I noticed the small white cottony seeds, floating like snowflakes past my car. Is that from our cottonwood? I wondered. For two months, we’ve raked cotton out of flowerbeds, picked it out of potted geraniums and roses, and scooped it out of our pond. Each time after we clean up, everything turns white again. We have never seen a tree produce this much cotton. Ever. And we’ve lived among Rio Grande Cottonwoods almost all our lives. Last night, as has been the case many nights, this female cottonwood is the topic of our conversation. Jim and I gripe about the fact that there doesn’t seem to be an end in sight. 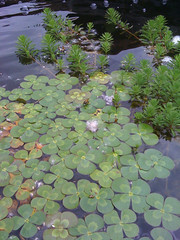 It is almost July and cotton is still dropping in clumps on the patio and in the pond. Dee, listening to us, interjects. Jim and I stop complaining and look at one another. “Well, that may be,” Jim sadly concurs. The Rio Grande Cottonwood is a flood-plain tree that reproduces by seeding. Described this way by Southwest journalist Jay W. Sharp, Once free, a seed, with a viable life of no more than a few days to a few weeks, begins a desperate, and usually a hopeless, race for survival. It must land on moist alluvial soil and swiftly extend roots toward subsurface water. If the soil dries too quickly, the seedling dies. Given sufficient moisture, however, the seedling may put down roots three- to five-feet deep in the course of a summer. If it survives trampling, fire, flood and animal feeding, it will become a fast-growing tree, always heavily dependent on a reliable water supply. But because of Rio Grande water management — dams and channels that hold back spring floods — and overgrazing and population growth, which reduce the water table, the tree is in peril. 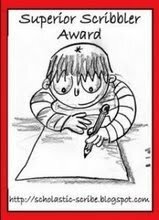 As is often the case, a child’s innocent statement snaps us out of our disgruntled state. Instead of focusing on the work it’s taken to keep up with this one female tree, we should be sitting back and admiring her abundance. Surely a handful of her many, many seeds will make it to wet soil somewhere out there and go on to perpetuate that most characteristic feature of this Rio Grande Valley — the cottonwood. 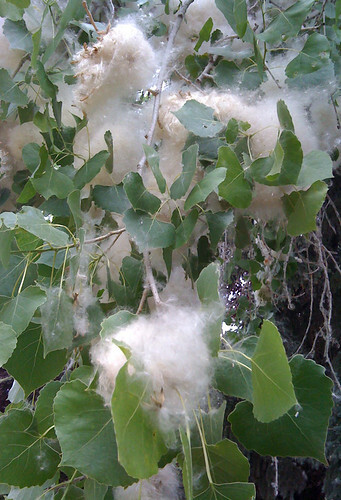 Cottonwood trees are dioecious, meaning they have male and female flowers on separate trees. The female tree produces cotton, and the male tree (cotton-less) produces pollen. The Cottonwood is a member of the Willow family and the poplar genus. The Rio Grande Cottonwood (populus deltoides) is a fast-growing tree; it is a variety of the Eastern Cottonwood, which is the fastest growing tree in North America. The Rio Grande Cottonwood was often a welcome sight to travelers in the desert because it signaled the presence of water nearby. These trees typically reach the height of 50-60 feet, although some of the grand old trees in the bosque (forest) are 90 feet tall, with trunks five feet in diameter. Young cottonwoods take years to mature and flower, which is why some female cottonwoods can suddenly start producing cotton after years of no cotton production. Some municipalities have ordinances against female cottonwoods, as the windborne cotton is viewed as a public nuisance. The Southwest’s riparian forests — woodlands along banks of streams or rivers (what we call the bosque) —are now among the most threatened woodlands of North America. Local carvers have traditionally used roots from the cottonwood that have been undercut and swept downriver to make their spiritual art (Pueblo Indians make kachina dolls and Hispanic santeros make bultos). As cottonwoods vanish, the carvers are forced to buy their wood. In many communities along the Rio Grande, there is now an effort to plant and repopulate the cottonwood to ensure its survival, as it is part of our history and our culture. Time will tell whether these actions succeed. The Rio Grande Cottonwood’s disappearance from the banks of Southwestern streams and rivers can now be regarded as a metaphor for our relentless abuse of the environment of the desert Southwest. And looky here…you’ve given me so many facts on this tree….I can see why you might find it annoying at times. I don’t have to live ‘in’ it…I can just sort of walk around it. Hope it does NOT become extinct…what a shame that would be. Why is it that I would be tempted to gather as many seeds as I could, and walk along the river tossing handfuls here and there? Ybonesy Cottonwood Seed…the Legend of the Bosque. 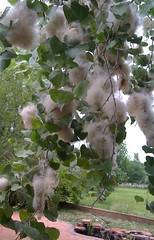 I love Cottonwood trees and I love the cotton that flies around. When I ride my bike on the Bosque trail I try to catch ’em as I fly past them and they fly past me. The cotton and cottonwood reminds me of youthful days when we had no heavy responsibilities when June meant being outdoors all of the time and walking among the graceful giant cottonwood trees when the moon is full. I never stop enjoying them. I hope I never will. Leslie – I’ll join you in tossing handfuls of Cottonwood seeds here and there. Wise science teacher to try to instill the feeling of wanting to protect things like cottonwood trees. I’ve always felt the Rio Grande to be a sad statement on our species attempt to control the natural world for our own selfish purposes. I always imagined the Rio Grande as, well, grand, and I could barely look at the poor stretch of a river as it traveled in southern Texas towards the Mexican border (in Big Bend National Park) “This” was the Rio Grande? How I would have loved to have seen this river when it was really a wild river? My oldest daughter spent a week canoeing Big Bend as part of a school program. She loved it. I would love to go there, although by the time it’s gotten that far south, it is probably nearly a dribble. In times of high drought here, it hardly seems to have water. It is a dwindling river. Ah, leslie, Neece and I can go out this weekend and drop our clumps of cotton along the river. Great idea. I like that. 8) Is that what Johnny did with apple seeds? I honestly don’t know that legend, btw. Now you’ve piqued my interest. Amazing how children have a way of cutting right to the heart of the matter. I imagine clean-up won’t seem like such a chore now. We had a cottonwood in the neighborhood we lived in prior to purchasing the house and property where we are now. I’d never seen anything like it before, all that cotton being blown around. Meant to add that I’m loving the idea of you, Ybonesy, as a modern day, cottonwood version of Johnny Appleseed. The Johnny Appleseed story is big in Ohio. My children had to do a project about him every year while in grade school. Other than a claim to the Wright Brothers, he’s the biggest thing we’ve got as far as legends go. ybonesy, what a wonderful tree post. I love the old cottonwoods and it never occurred to me that there was a Rio Grande Cottonwood and an Eastern Cottonwood. I imagine we have Eastern cottonwood variety here in MN but I don’t know for sure. I love the cottonwoods in New Mexico. They remind me where water is (or once was) in the desert. I also love the cottonwoods in Minnesota. In fact, the time of year when the cottonwood seeds fall like snow is one of my favorites. I love the way they look when they are flying on the wind. Cool photo link to the snake-like appearance of the Rio Grande from the air. Your comment to Bo about the aerial photographs of the Rio Grande River by Adriel Heidey reminds me of another photographer/pilot I love, Marilyn Bridges. I just pulled her book Markings: Sacred Landscapes from the Air off the shelf and looked at it again. In this book, she photographed sacred sites from the air. I especially like her work of the Nazca Lines in Peru. There are essays in the book from Maria Reiche and Lucy Lippard. I love how you were reminded by Dee that the cottonwood could become extinct. I consider it one of the Mother Trees. Wouldn’t that be the saddest thing ever? And how sad for the carvers who now cannot find the cottonwood roots to carve. We are losing parts of this Earth at an astounding rate. BTW, I’ve never seen as much cottonwood on a tree as you have in those photos of the tree in your yard. WOW! Great links, QM. The Nazca Lines are fascinating. The fact that they’ve endured since possibly 550 AD or before, first of all. And how they are made, with such precision on that scale. I can see how someone might dedicate her life, as Maria Reiche did, to the study of the lines. 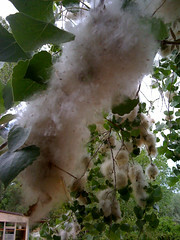 I do love the cottonwood season, in spite of the fact that we were overwhelmed by the cotton on this one tree. It has been bizarre. And it’s still there. We have gotten quite a few volunteers at this place, and we got them at our old place, too. We always encouraged them, and transplanted any that came up in the wrong place, too close to the house, for example, out somewhere else. One of my transplants this spring did not survive, and I’m sad about that. Cottonwoods are my favorite trees. There are some amazing ones here, and besides the reseeding (replanting) in the bosque, there is also a program of Heritage Cottonwoods, those trees in the village that are particularly old. There’s one at the end of our road that is huge. I had no idea cottonwoods actually produced cotton. It is really quite beautiful if you don’t have to clean up after it. Surely it would make good stuffing if you don’t have a spinning wheel. 🙂 Thanks for the lessons. I enjoyed all of this. Thanks, diddy. Maybe you’ve seen the cottonless cottonwoods but just didn’t know it. Hey, what is your favorite tree? And did you used to use your spinning wheel at one time? QM, I do wonder about how far away those seeds can blow. I know the cottonwood is the state tree of Wyoming, but that’s the Eastern Cottonwood, I believe. breathepeace would know. And the tree of Kansas, I think, or is it Missouri. Bob would know. That cottonwood is really something. I love the cottonwoods out there in the Southwest. Spiritual trees.